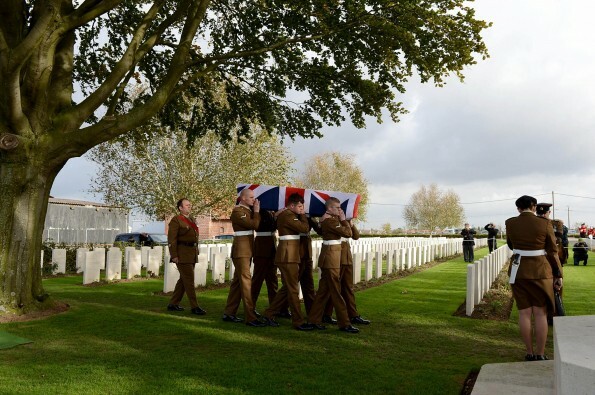 ONE hundred years after his death, a First World War soldier has finally been given a burial befitting a hero after his remains were found by French construction workers. On October 18, 1914, soldiers from 2nd Battalion, the York and Lancaster Regiment advanced on the small hamlet of Beaucamps-Ligny, west of Lille in Northern France, and encountered an enemy force vastly superior in numbers. The battalion suffered substantial casualties with 93 wounded and 34 killed in action. 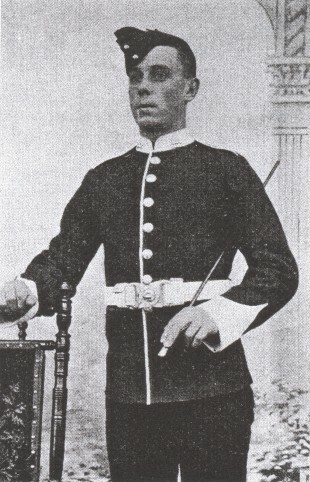 In 2009, Newcastle-born Private William Alfred Singyard was one of 15 soldiers from the battalion whose remains were discovered on a building site at Beaucamps-Ligny. Today, (Wednesday, October 22), almost a hundred years to the day after his death, Private Singyard and his comrades were reburied with full military honours. The soldiers were re-interred at the Commonwealth War Graves Commission Y-Farm Cemetery in Bois-Grenier, Northern France. Private Singyard was one of 11 of the soldiers to have been identified through DNA samples supplied by surviving relatives. Their identification followed an extensive project conducted by the Historic Casualty Section of the Ministry of Defence (MoD) Joint Casualty and Compassionate Centre (JCCC). The MoD still hopes to identify the four remaining sets of remains and believes two may be Lance Sergeant George Edwardes (9854), who was born in Middlesbrough, and Thornaby-born Private David Wilson Williams (8458). Soldiers from 4th Battalion The Yorkshire Regiment (4 YORKS) performed the ceremonial duties at Wednesday’s ceremony, providing a bearer party and firing party. A reservist battalion, the soldiers took time off from their civilian jobs to take part in the service. Those in the bearer party included a fireman, barman, an accountant and a gas fitter. The re-internment was watched by surviving relatives and local French townsfolk. The service was conducted by the Regimental Padre, the Reverend Ben Norton, from the St Cuthbert’s Church in Marton, Middlesbrough, while music was provided by the Band of the Yorkshire Regiment. “It was a great honour to take part in the ceremony and it provided an opportunity for us to pay our respects to our fallen,” said Lieutenant Colonel Ian Hallam, Commanding Officer of 4 YORKS. The other nine soldiers to be identified were: Private Herbert Ernest Allcock (Leeds); Private John Brameld (Sheffield); Corporal Francis Carr Dyson (Wakefield); Private Walter Ellis (Doncaster); Private John Willie Jarvis (Rotherham); Private Leonard Arthur Morley (Boxhill, Surrey); Private Ernest Oxer (Rotherham); Private John Richmond (Nottingham), and Lance Corporal William Henry Warr (Dorset). Anyone who thinks they may be related to the two soldiers from Teesside can call the Joint Casualty and Compassionate Centre team on 01452-712612, extension 6303.